Egypt's military ruler has said the decades-old state of emergency will be lifted partially on Wednesday, the first anniversary of the uprising against former President Hosni Mubarak. 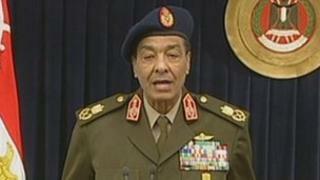 Field Marshal Hussein Tantawi said the law would still be applied in cases of "thuggery", without giving any details. Egypt has been governed under emergency law almost continuously since 1967. It gave the authorities extensive powers to suspend basic rights, such as prohibiting protests, censoring the media, monitoring personal communications, and detaining people indefinitely without charge. Mr Mubarak repeatedly broke promises to lift the state of emergency, which has been in place without interruption since the assassination of President Anwar Sadat in 1981. Field Marshal Tantawi's announcement came a day after the lower house of Egypt's parliament held its first session since Mr Mubarak stepped down and the Supreme Council of the Armed Forces took power. "Today, after the people said their word and chose their MPs in the People's Assembly to assume legislative and monitoring tasks, I took a decision to end the state of emergency in the entire republic except in confronting the crimes of thuggery," he said in a televised address. "This decision will take effect on the morning of 25 January." Correspondents say the partial lifting of the emergency law is unlikely to satisfy pro-democracy protesters and human rights groups. The BBC's Jon Leyne, in Cairo, says that the reference to "thugs" is a definition that can be as broad as the authorities want it to be, so the move is unlikely to be acceptable to many in the opposition. With a new parliament in place after elections, the military may feel a little more comfortable than they did a few months ago, he adds, but they will be challenged once again during this anniversary, by some of the many Egyptians who think that the old regime is still in place.